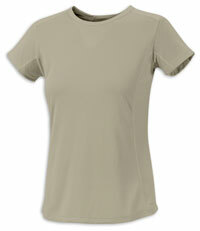 Columbia says:"This easy-care, easy-wear top is a must-have for all your outdoor endeavors. Made of soft, moisture-wicking jersey knit, it features flattering curved seams that are strategically placed away from contact points to avoid chafing." An attractive, flattering looking top that fitted very comfortably - I'm a standard UK size 12 and was wearing the Medium size. It's a good length and looked equally good over or tucked into trousers. I wore it during a three day camping/walking trip when I had a number of long days walking in relatively warm conditions (21-23 deg C). I was really very comfortable throughout - the wicking and breathability of this fabric is fine. Moreover - I can report that the antimicrobial treatment did function well - I was happy to wear the Tee for several day's consecutively! The manufacturer's care instructions suggest that the Tee should be washed at 30 deg. I inadvertently washed it at 40 degrees and it seems fine. It dried quickly and was wearable straight from the washing line. A versatile, good looking top. A smashing option for walking, other high energy activities or for leisure.